Not Writing Records to the Logfile. I’ve been using the Kale and A LOT of basil. I thought I had fixed the challenge I was having writing records out to the log file. Well…I haven’t. I just looked at the most recent log file and see that it only has 28 rows. Hmmm….In this post I find and fix a memory leak but first I take a step back to understand how memory is used by the Arduino. I am glad I did. I now have a much better conceptual model with where my code is going versus my variables…even though I “sort of” knew this, I did not have a strong enough conceptual model in my head…I guess I lost my memory about (Arduino) memory. Adafruit: Thank you for your excellent tutorial on “Memories of an Arduino.” I am an extremely happy customer of Adafruit. 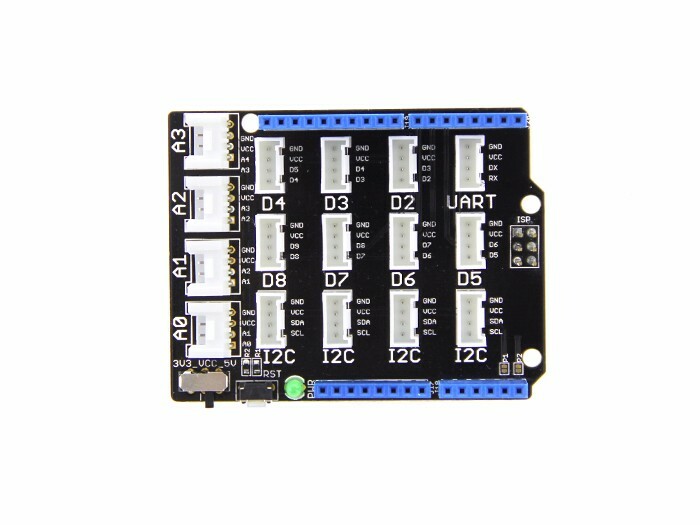 I feel great about buying from Adafruit because I feel that a lot of the margins made are given back to us through these great tutorials, youtube videos, friendliness, etc. Adafruit is NOT a company in which a few (usually white men) are making a ton of money while they lack the compassion shown by Adafruit. Again THANK YOU. The version of TheLeafSpa.ino that evolved from this post is located at this GitHub location. I decided to take a step back and appreciate the memory architect used by the Arduino. It’s like going into a place that does wine sampling. A moment to reflect on why something is the way it is, and appreciate it for what it is…OK..enough with the analogies. Adafruit’s excellent section on memory architecture, notes on the Arduino, Flash = Program Memory and SRAM = Data Memory. “The Arduino UNO has only 32K bytes of Flash memory and 2K bytes of SRAM.” Note: for completeness there is also EEPROM. However, theLeafSpa.ino challenge would be on how much Flash and/or SRAM the code is using. Sketch uses 24,970 bytes (77%) of program storage space. Maximum is 32,256 bytes. Global variables use 1,416 bytes (69%) of dynamic memory, leaving 632 bytes for local variables. Maximum is 2,048 bytes. but…I underemphasized the term “dynamic” in my thinking. The amount of SRAM changes. to know the length of stringBuffer and additionalInfo. Are they what I expect them to be? // an event has a log row type followed by date/time followed by additonal info. The most glaring thing I notice is SRAM is lost after writing a row that has a record type that is not a sensor reading (i.e. : record type is not 0 and before writing a sensor reading. I highlighted these occurrences above. I changed the log file row types for the amount of SRAM. AmtSRAM = record type 11. The amount of SRAM starts out as 545 bytes prior to writing out the first record (53). It goes down to 523 before writing out record type 10 (warmup is over). This is a loss of 22 bytes which remains consistent. So at this point, I’m not researching deeper. When a relay gets switched there are some bytes that get lost. However, these return. The SRAM stays around 523 bytes. This will work. I enjoyed working on this. It is always fun to learn and seeing positive changes based on applying what I have learned. Besides adding in the Flow Meter code, I’ve been checking the log files and decided to add additional information such as what were the settings being used for LED, pump, CO2 on/off, etc. As I added this to the code, I started getting messages that the amount of memory left could lead to unpredictable results. Drat. The days of “getting this working as quickly as possible” coding on the Arduino Uno platform are over. Besides, I’ve switched from poking at the code to relying on keeping the plants healthy and happy. I am getting a lot of use from the log file information…so most likely I will be wanting to add more rows. I will buckle down on fixing up how strings are handled within theLeafSpa.ino. The folks behind the Arduino Uno and the Arduino IDE: I am EXTREMELY grateful for the Arduino Uno environment. The IDE is simple and easy to get started in. There is a library for every sensor and peripheral. This environment has saved me massive amounts of prototyping time. This blog post will discuss changes made to TheLeafSpa.ino. The specific version discussed is found at this GitHub location. Libraries available for practically every sensor or device a DIYer wants to interact with. A VERY supportive and helpful community. It is easy to Google and discover how to do exactly what you wish to do. Lack of source line debugging. Compiled language – compared with Python where you can try something and get immediate results. Limited memory which you will most likely run out as your prototype grows. This is the case with the Leaf Spa. A programming language that is more C like than a simple language like Python or the extremely well done Swift language. Lack of a “native” Internet support similar to what we’re seeing in the WiPy area. Unfortunately, I didn’t record the benefit of each change I made as I tore through theLeafSpa.ino…but here is a list of the stuff I did. The debug library – even when turned off – affected the amount of memory. The debug library proved extremely useful when initially developing the prototype code. However, the library became less useful as the code became stable and I started relying on the log file instead of printlns to a serial monitor. Environments like Swift and Python make handling strings exceptionally easy. The Arduino IDE provides a similar simplistic experience through the String() object. The challenge I ran into is this abstraction took away too much control over how much memory was left. In an environment in which each additional byte of memory starts to matter, control of the memory outweighed the simplicity of coding (unfortunately). When I first removed the String() object, I replaced creating a string with ints and floats with sprintf(). However, the code using sprintf() was still too big. character arrays and char pointers. itoa(), dtostrf(), strcpy() for int, float, and string conversions. Using two global char arrays – stringBuffer and additionalInfo to store info that will be written to the log file. This is good enough for now. If I need to reduce program storage space, the next thing I probably will look into is not using dtostrf(). Here is the difference when no dtostrf() is used compared to when it is. Sketch uses 450 bytes (1%) of program storage space. Maximum is 32,256 bytes. Global variables use 9 bytes (0%) of dynamic memory, leaving 2,039 bytes for local variables. Maximum is 2,048 bytes. Sketch uses 2,022 bytes (6%) of program storage space. Maximum is 32,256 bytes. Global variables use 9 bytes (0%) of dynamic memory, leaving 2,039 bytes for local variables. Maximum is 2,048 bytes. The code is more windy, but it does do what I want – give back enough RAM to stabilize the code. I love watching Limor/Lady Ada take apart a Consumer Electronic device and explain to us what the chips are and what is going on. I thought what a great learning opportunity to take something that I have some familiarity with – in this case pH and EC circuits – and find a product to take apart and figure out how the circuit works. The product I picked was the ph/EC-983. I picked up a couple on eBay. This handy tool integrates a pH and EC probe as well as gives a temperature reading. It is inexpensive and if it is “good enough” I was thinking it would be super amazing to plunk the probe in the nutrient bath. I would use firmware to take pH/EC measurements and use the measurements to adjust the pH and nutrients. So that I could put the probe in the nutrient bath and connect up a pH/EC circuit to be monitored through firmware. Hmmm…I couldn’t pry apart the device in the nice, clean way Lady Ada is able to…so…out came the Dremel! To get started, I looked at the active parts. From the data sheet: The HEF4053B is a triple single-pole double-throw (SPDT) analog switch, suitable for use as an analog or digital multiplexer/demultiplexer. This page on Basic Electricity has a great discussion on switches including SPDT switches. From the data sheet: The HEF4011B is a quad 2-input NAND gate. From the data sheet: The HEF4030B is a quad 2-input EXCLUSIVE-OR gate. From the data sheet: The SGM3005 is a dual, low on-resistance, low voltage, bidirectional, single-pole/double-throw (SPDT) CMOS analog switch designed to operate from a single 1.8V to 5.5V power supply. At this point, my eyes hurt. Time to stop for now. Awhile back, the plants were not getting any water/nutrients because the pump relay stopped working. It became clear to me after this incident that a flow meter monitoring whether the pump was working would be very beneficial to have as part of the Base section of the Leaf Spa. This post is about incorporating the flow meter into the Leaf Spa. Adafruit – Thank you for your awesome customer service. Adafruit goes above and beyond any company I know providing sample code, tutorials, excellent forums, products I can trust to work. Products cost a bit more…but I really want Adafruit and companies who respect their customers and employees. I got a liquid flow meter in the mail from Adafruit yesterday. My goal is to detect whether water is flowing through the sensor. I’ll do this in the firmware by figuring out if the flow rate is > 0 when the pump is supposed to be on. I haven’t used a flow meter before so I figured I should know at least a little bit on how it works. T.K. Hareendran’s blog post, “Working with Water Flow Sensors & Arduino”, gave me great info on the basics of how this type of flow meter works. For example, I find out the type of sensor I bought is a YF-201 Hall-Effect Water Flow Sensor. As pointed out in the article: This sensor sits in line with the water line and contains a pinwheel sensor to measure how much water has moved through it. There is an integrated magnetic Hall-Effect sensor that outputs an electrical pulse with every revolution… By counting the pulses from the output of the sensor, we can easily calculate the water flow rate (in litre/hour – L/hr) using a suitable conversion formula. I’ll be looking at the flow rate of water when the Leaf Spa firmware turns on the pump relay. If there is no water flowing, something within the pump system (the pump itself, the relay) is not working. As usual, Adafruit has provided superior support for the flow meter by making available a sample Arduino sketch at this GitHub location. Getting this sketch working was easy and gave me a better feel for how the flow meter works with the Arduino. I’m going to use an external interrupt (the attachInterrupt() API) to let the firmware know when water is flowing through the sensor. The test sketch that seems to work – FlowMeterTest2.ino – is located at this GitHub location. seems I’m not lacking SD libraries :-). Turns out the one being used was the library that I updated yesterday…the SD library folder within my Arduino/libraries folder. I deleted the SD folder. Now the firmware is back to using the SD-master library…which includes the end() API. The firmware is using attachInterrupt() with pin 3. This means I’m restricted with the current hardware configuration to using pin 2 for the flow meter. DHT is on pin 4 instead of pin 2.
pump relay is on pin 9 instead of pin 4. Flow meter is on pin 2. 1 in the first column means the pump has turned on. 2 means the pump turned off. The row identifying the pump was turned off now includes a column with the flow rate in liters/minute. Both are > 0 which means water has gone through the plumbing. YIPPEE! The first flow rate shows 167 liters/minute (~44 gallons/minute). The second shows 175 liters/minute (~46 gallons/minute). The pump’s data sheet (I am using the 160 GPH model) states the model I am using has a min GPH of 106 and a max of 175. The values for the flow rate ARE NOT ACCURATE however, the Leaf Spa is detecting whether the water is flowing. So, for what I need it to do, the flow meter is doing ok. At this point, I do not need the flow rate. If I did, I would debug this further. Of course, measuring the flow rate as accurately as possible should be part of the Leaf Spa. But since my goal at this point is to detect water flow, I will not debug now. Future builds should accurately measure water flow. Frankly, I am not surprised measurements are off. I did not do any flow rate accuracy testing before putting the flow meter in. Yippee! The flow meter is in place. I’m exploring if this leaf stress is caused by the air temperature being too high. I just turned down the light intensity. Turning down the light intensity will lower the air temperature a bit. In this post I’m focusing on designing and 3D printing a fan mount that will be attached on the left side of the Grow Chamber. This way, the left side will be more balanced to the right in terms of air temperature and access to CO2. I’ll be including a hole for a CO2 tube. I plan to split the CO2 tubing so that both the left and right side will receive CO2 when the CO2 valve is turned on. I’ll start with the Fusion 360 model I made – and am using – for the right fan mount. I will modify the model such that the bolt mounts go through the plastic and attach to the LED Shelf with a nut. This way, the plastic doesn’t have to handle screw/bolt threading – a weakness on the right Fan mount. Now that I have the fan mount 3D printed, it’s time to wire up power in a way that both fans share the 12V power supply. I put connectors on wires going between the Grow Chamber and the Base because I have this new idea to bling out the Leaf Spa so that I can wheel it outside during the summer. One improvement down…many more to most likely come! This time I used a small tri-pod to hold the camera. Not ideal, but does show the plants ok. The plants near the fan are getting a nice air flow. The Stevia leaves (plants closer to the camera) are curling in. My first guess is the leaves are either getting too much light and/or the temperature is too high. The leaves themselves are all green, so at this point I do not believe the curling is due to too much nutrients. I’ll be adjusting the lights based on the discussion in this post. I’ll address the temperature in a subsequent post. Isn’t it FANTASTIC that increasing the CO2 can decrease the cost of lighting? I am practicing sustainability. I am not only interested in the $ cost, but also how much energy is currently being used by the Leaf Spa and if there are things I can tweak to minimize both costs without compromising healthy leaf growth. The current amount of power used by the LEDs is 95.8 W. The amount of energy used up within a 24 hour period = 95.8 W * 20 hours / 1000 = 1.9kWh. From a $ perspective, Chart 2 from the Bureau of Land Statistic’s web page notes 1kW costs us folks in Seattle around $.10. So 1.9kW $.19 per day. I have not optimized the settings for light intensity in the presence of higher CO2 levels. Indeed, I haven’t evaluated the current light intensity with what is considered a healthy light intensity for the leaves. The goal of this post is to see if I can tweak the light intensity to a lower amount such that costs in both energy and money are decreased. given the same amount of light, the photosynthetic response is increased when the CO2 concentration is higher than the normal (of ~400ppm). Since CO2 level + light drives the photosynthetic response rate, we can get to the same leaf mass with less light if light is supplemented with CO2. YIPPEE! Given the research results for lettuce – and making a wild extrapolation…a guesstimate I most likely shouldn’t be making but will experiment with is using 30% less light. Basil had comparable growth (fresh and dry mass, branches, nodes) across nutrient solution ECs and there were no significant differences (Figure 1). Figure 1. Sweet basil grown with ECs ranging from 0.5 to 4 mS∙cm−1 under low (~7 mol∙m−2∙d−1) or high (~15 mol∙m−2∙d−1) daily light integrals (DLIs). This photo was taken three weeks after transplanting seedlings into hydroponic systems and treatments. Although EC has no effect on basil growth, growth increased for all three basil species grown under ~15 mol∙m−2∙d−1 compared to those grown under 7 mol∙m−2∙d−1. 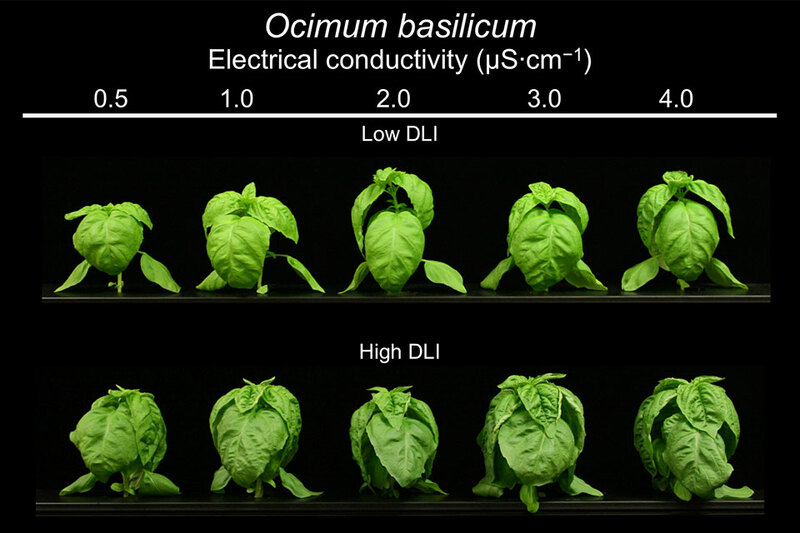 There was no interaction between the EC and DLI on basil growth. This amount of DLI + ~1200ppm CO2 should get to the equivalent photosynthetic rate as a DLI of 15 mol·m-2·d-1 + ~ 400ppm. I’ll be using the calculation for DLI I discussed in this post: DLI = PAR reading x (3,600 * photoperiod)/1,000,000. In this post, I gave my initial readings for the Leaf Spa PAR levels. The readings were far from uniform, ranging from 288µmol/s at an edge to 737µmol/s at the center. Using the COB LEDs makes for uneven PAR as shown in the table below. COBs are perhaps best for lighting when the light source is significantly higher than the canopy. For the small height of the leaf shelf, smaller LEDs spread uniformly across the bottom of the shelf – or other mechanism (such as using lenses, i.e. : exploring optics) to smooth out the LED’s emittance – should be explored. I just took measurements at each plant base and then at ~the top of the Stevia plant. Whoa! That’s more than is required. the top of the Stevia Leaf: (11 * 1000000)/(613 * 3600) = 5 hours. Given unevenness of PAR – both from a plant location within the Leaf Spa as well as how far the leaves are from the LEDs as they grow, I need to pick an approximate value for the PAR to base calculations on. I want to use a conservative approximate PAR value. Looking at the measured values, I’m choosing 400 PAR to base calculations at. hmm….I want the lights to be on for 16 hours. The LED Driver I am using is the Meanwell 709-ELG100-C1050A. I purchased this Meanwell driver from Mouser (product link). I am very happy with this driver. However, up until now I hadn’t thought much about lowering the light intensity. 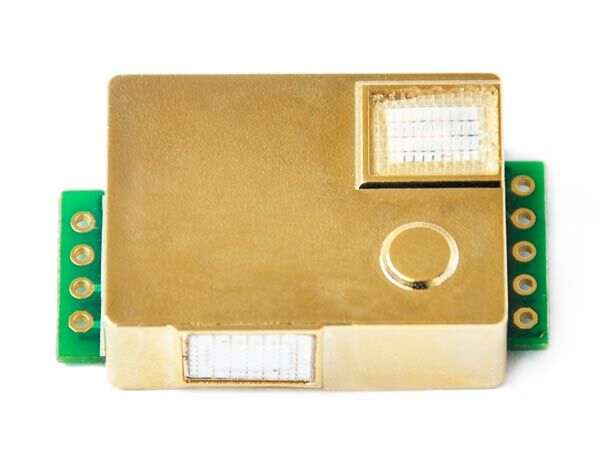 Future LED driver designs should take into consideration how the light intensity can be adjusted. The C1050A can be adjusted from 525 – 1050mA. To get to 15 moles/day on a 16 hour photoperiod, the (average) PAR should be ~ 200. This means I can lower the current to the low end. I noted earlier the current amount of power used by the LEDs is 95.8 W. The amount of energy used up within a 24 hour period = 95.8 W * 20 hours / 1000 = 1.9kWh. $ amounts vary. Given $.10 / kWh, the cost = $.19 per day. Lowering the current brought the power used down to 46.7 W. I also adjusted the photoperiod to 16 hours. With this setup, the amount of energy used within a 24 hour period = 46.7W * 16 hours / 1000 = .75kWh at $.10 / kWh, the cost = $.08 per day, half as much. decreasing the temperature of the Grow Chamber. increasing the lifespan of the LEDs. That’s it for now. Time to move on to another adventure. This post is a reflection on the growth of the plants that are living their lives in The Leaf Spa. I came home after five days. Whoa – the top leaves of the basil are getting burnt by the LEDs. And look – I can tell that is a Kale plant…ooh – the Stevia plants grew. That’s a relief since I just finished reading blog posts on how hard it is to grow Stevia from seed. YIPPEE! The basil plants are too tall for the current LED shelf height. Should I move the shelf up OR should I trim the basil plants down so the other plants aren’t penalized with less PAR? Right now the Leaf Spa has one CPU fan that benefits the plants on the right side of the Leaf Spa. Putting a fan on the other side would benefit plants on the left side. It would also be beneficial to release CO2 from both sides. I am happy with the plant growth that has occurred within the last 2 1/2 weeks. However, there is A LOT of room for improvement. The current results are promising. I am eager to evolve the Leaf Spa experience into the ideal controlled environment for the plants as I learn more about (and implement) what works best. Now that I have explored reading the CO2 sensor using PWM using an Arduino (GitHub location of Arduino sketch), I want to do the same using Micropython. Since I got a nifty WiPy awhile back, I thought I’d start with using this hardware rich micro python platform. Getting to the punch line, I was able to calculate what appears to be a reasonable CO2 value using Pin interrupts. I am not sure how reasonable because I cannot test/calibrate with Leaf Spa readings for a few days. I stumbled over several challenges including my lack of python knowledge. But…I also became frustrated and lost time because of whimsicalities I ran into using the WiPy PyMakr IDE as well as the WiPy implementation 1.8.7 of pycom I was using. At this point, I am not convinced micro python is ready for me to use for the Leaf Spa. However, I plan to continue exploring micro python using Adafruit’s feather Huzzah. So the folks who designed and built the MH-Z19 encoded CO2 readings by modulating the ON/HIGH (which determines the OFF) time within a cycle. is there an equivalent pulseIn function to the one I used to create this Arduino sketch to read the MH-Z19? Not really. is there a pin change interrupt API that fires when the pin changes state from high to low and from low to high? Yes. set the Pin reading the pwm to callback to rising() when the rising part of the pulse is detected. once rising() is called back, start a ms timer that once a falling edge is detected will give us the th value. Set the Pin to callback to falling() when the rising pulse is detected. once falling() is called back, stop the timer and set th. Set the Pin to callback to rising() one last time so we can set the tl value. rising() gets called back one last time. Set tl. The way I was able to finally reference the pin I was using for PWM in was time consuming/frustrating. This is because the documentation (to me) is confusing. which seems to by in the 1.8.4 WiPy documentation, but missing from the 1.8.7 documentation! ….Grrrrr….. Figuring pin identification was exacerbated by this statement in the 1.8.7 documentation….Grrrrr…..
Well…I’m stopping my exploration into measuring CO2 using the MH-Z19 connected to a WiPy for now. When I get back home, I’ll test/calibrate within the Leaf Spa. Today is daylight savings. Unfortunately, the RTC doesn’t know this and now the time is off by one hour. The Leaf Spa needs to accommodate Daylight Savings. How I’ll do this is TBD. I recently received two Winsen MH-Z19 NDIR CO2 sensors I ordered from Alibaba. The cost is less (I paid $22 for one). The interface to the micro controller does not rely on the UART. As noted in diy_bloke’s Instructable: The MH-Z19 has 3 ways of reading the CO2 concentration. It has a Tx/Rx UART, It has an analog output and it has a PWM input. I’m hoping this will make it possible to use with microPython on the esp8266 enabled board. According to the diagram, the pins 2 and 3 are for UART readings and pin 9 is for PWM readings. Drat…i forgot to capture the results. Tests 1 and 2 were within error range of each other. The results were ~ 150ppm lower than the MH-Z16 sensor. BUT I have not calibrated the MH-Z19. I want to do that when I get back from vacation. Note: the MH-Z19 can be read through PWM, however calibration happens through the UART. Not a big deal…but does point out that not all functionality can be handled through digital i/o. less expensive than the MH-Z16 with enough accuracy. does not need UART to read CO2 data. it is an NDIR CO2 sensor, so it is measuring CO2 instead of estimating – which is what the CCS-811as a VOC sensor does (see wminark’s comment on this blog post). It is more readily available than the CCS-811. I put an order in for a few CCS-811’s on Digikey months ago…the current estimate is a few weeks from now. However, that date has changed before. Perhaps if I was buying in the bulk amounts a cell phone manufacturer needs…but at the small quantities I need, I don’t feel comfortable with my ability to source the CCS-811. Learning about the MH-Z19 was awesomely fun and useful. I am excited to try the Leaf Spa firmware using micro python and the ESP8266…! Um…sadly…I’m having a fight with the camera mount I put together. This is impeding my willingness to take pictures. Then the pump stopped working which happily this story ends with me able to fix the pump. So…the pressure was too much to actually take a picture of the plants. Silly. What’s Going on with the Pump? Although the plants look like they are getting nutrients, I’m concerned I haven’t been hearing the water pump through the system…is the pump really turning on / off? I will install a flow meter within the path of the water like DIY hacking did on their post. I just ordered Adafruit’s flow meter. I did my irrational order before thoroughly checking out if it would work. I purchased from Adafruit because I value what the company stands for and the amount of knowledge Adafruit shares with the community. Look at the log file. Does the log file show recent records that the pump was turned on and off? What time period is the pump supposed to be on? The log file (sheet 03102017_1245) DOES show the pump is turning on/off as expected. The log file records the pump turning on every 15 minutes and staying on for one minute. The pump should have turned on four times an hour at 3, 18, 33, and 48 minutes past the hour. Stand by the Leaf Spa when the pump is supposed to be on. Did I hear the relay switch? Did I hear the pleasant gurgle of water? Check if the pump works by plugging it into a power source not connected to the relay. I am left to believe the relay switch is no longer working for the pump. Why Isn’t the Relay Switch Working? there are drips of water inside… DRAT… I had placed the relay box at a location where water from a leak in the plumbing could hit the relay box. A few drops entered through the wall sockets. Now I’m concerned because of safety. Some of the relay connections have a small amount of rust on them. It turns out, the relay being used for the pump stopped working. I rewired the relays, hooked the box back up. Now the pump, LED, CO2 relays are working. Now that the pump is back working, I decided to change the nutrients. As I do this, I am thinking through how the Leaf Spa system can make it (no 🙂 ) dirt simple. I am practicing sustainability. In the future, I will explore using organic fertilizers. For now, I mix chemicals. One step at a time. Clean out the bucket and mix fresh nutrients using my most awesome pH/EC meter to measure in the Jack’s Hydro nutes I use. I target an EC of around 3 mS/cm and a pH of around 6.1. I will evolve the pH and EC circuit / probe solution I did with the Ladybug Blue Lite and Ladybug Shield (there are previous posts on these projects) to measure and then automate the injection of the nutrients as well as pH UP/DOWN as needed. and siphon the water from the bucket into the Coleman through one of the net pot pipes (where the plants are). Sadly, this didn’t work. Still, I like the idea of not having to lift the lid off the coleman…. Need to figure out a better way to get the nutrients (or in the future water) from the bucket into the coleman using a pump. Thinking about the relay – on the one hand, WHOA – how stupid of me to put the box so close to where water could go through the plugs! On the other hand, it is one more day that gave me the opportunity to learn and solidify my knowledge about wiring relay boxes :-).